In our research and programmes, we collaborate closely with civil society organisations worldwide. Through joint publications and lobbying, we strengthen the position of local NGOs and trade unions and encourage engagement and policymaking in the Netherlands and Europe. MVO Platform is a network of Dutch civil society organisations and trade unions that are working together to promote corporate social responsibility.The MVO Platform promotes public policies that encourage corporate social responsibility and ensure that companies which do not act responsibly can be held accountable. 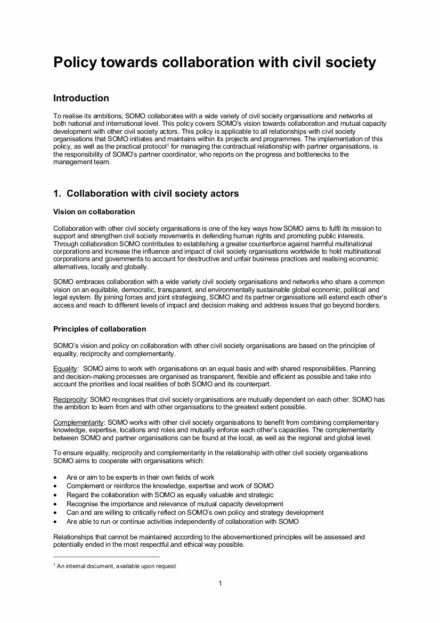 OECD Watch is an international network of civil society organisations promoting corporate accountability. The purpose of OECD Watch is to inform the wider NGO community about policies and activities related to the OECD’s Investment Committee Guidelines for Multinational Enterprises and to test the effectiveness of the OECD. OECD Watch aims to ensure that business activity contributes to sustainable development and poverty eradication and that corporations are held accountable for their impacts around the globe. GoodElectronics is a network of civil society organisations and individuals that are concerned about human rights and sustainability issues in the global electronics supply chain. Its mission is to contribute to improving corporate and public policies and practices with regard to protecting and respecting human rights and the environment in the global electronics supply chain, with a specific focus on big brand companies. Lobbywatch is an initiative of five Dutch NGOs that are concerned about the way lobby takes place in the Netherlands, especially the undocumented influence that companies have in political decision making. Tax Justice Nederland is a network that wants to raise awareness about the negative consequences of tax avoidance worldwide. The network and its members advocate for a fair global tax system. The Dutch network is part of the Global Alliance for Tax Justice.